Hello, Faithful Readers! I apologize for not living up to my promise to do another 13 days of Halloween this year. Life happens, and unfortunately, the blog sometimes has to take a backseat. Even though I was unable to do all 13 posts, the good news is I think I can squeeze in one tonight! For those of you who don't already know, Halloween is one of my favorite holidays. I thought I'd share another quick list of helpful things I've learned from Halloweens past. I'll summarize my list from last year, then continue it. If you'd like to read the breakdown of items 1 thru 8, you can read it here. 9. If you've started a new job, ask around and make sure people dress up on Halloween BEFORE you decide to show up in costume. 10. If Halloween falls on a Friday or Saturday night, don't expect as many trick-or-treaters. This may not be true for your neighborhood, but I've noticed that when Halloween falls on a weekend, instead of going trick-or-treating, people go to parties and such. In fact, each year, I've noticed a general decline in door-to-door trick or treating. This is probably because more people are participating in Trunk or Treat and other safer alternatives. Makes me kind of sad and nostalgic for the good old days, when neighbors all knew and trusted each other and you didn't have to worry about all the awful things parents worry about now days. 11. Fake blood stains EVERYTHING. The label on the tube might say it's washable, but I have yet to find fake blood that doesn't stain your hands, stain your clothes, stain the countertop... So just use it wisely, keeping this in mind. 12. If you want a unique costume, check out Goodwill. 13. Don't be THAT house. 14. There are lots of different kinds of horror movies - find out which ones your crew likes before you fire up the DVD player. 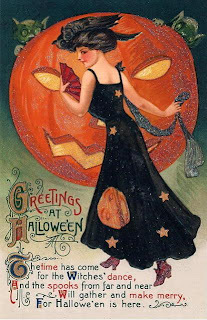 To read all 13 posts in last year's 13 Days of Halloween, just click here. Happy Halloween! Today should be the start of my 13 days of Halloween here on my blog, but since it's Musical Interlude Monday, and since I'm attending the U2 concert tomorrow night, (YES!!!) I've decided to break protocol and share a little music from our boys from Dublin. I will admit, I was a little late to the U2 party. When they were hitting it big with "The Joshua Tree" album, I just didn't get them or their music. I suppose I should mention that they were hitting it big around the same time in my life when I was listening strictly to do-whop and oldies music. (I was a weird kid.) So I just wasn't listening to mainstream radio period. Flashforward a few years, and I guess my listening ears had matured enough to appreciate them. I've grown to love them more and more ever since. 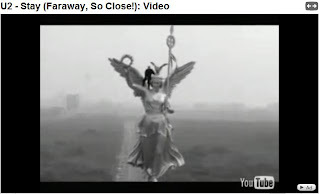 Here's my favorite song by U2, called "Stay (Far Away, So Close)" from their Zooropa album. I love this song because of the word pictures the lyrics invoke, combined with the music. It really paints an image in my mind. And the metaphors or language chosen for the lyrics seems so simple but at the same time is so complex. Bono is a genius at turning a phrase. I also love how the song starts out so quiet and intimate, and then it grows in power and intensity and Bono's voice just breaks through and soars on the choruses. There are better songs in their catalog (especially ones that showcase the Edge's amazing talent more), but I guess this song just hits me in the right spot. I can empathize or relate to the desperation and longing in the song. It vividly reminds me of a certain time in my life... pretty cool, when music does that! You Tube won't let me embed the video, so just click on the picture below and it will launch the You Tube video in a new window. Here's a little music to round out our Monday evening. Take two guys and two gals who really know how to rock it out and what do you get? You get one of my favorite Christian bands (that actually gets played on secular radio stations - how cool is that?) - Skillet. My favorite song off their album Comatose is "Whispers in the Dark". Unfortunately, they haven't made a video for that song yet, so here's their video for another song off that album, "Rebirthing". Like what you hear? Check out the song "Savior". Their new album, Awake was released last month and the radio single "Monster" is worth checking out too. Enjoy!